On 2 November, Burundi joins the world in celebrating the International Day to End Impunity for Crimes against Journalists. Some Burundian journalists say they lack a forum where they can talk about the problems they are often faced with. “It’s a big challenge that we do not have a forum or another appropriate platform to talk about our profession-related issues”, says a journalist working for a local radio station in the capital Bujumbura. He says the Union of Burundian Journalists-UBJ used to assist journalists especially when they were unjustly accused. “It is currently not easy for a journalist to get justice if their media organization does them injustice”, he says. L. Inamahoro, another journalist working for a local radio station, says the challenges that Burundi journalists are faced with will find solution if they have an appropriate forum to talk about them and good representatives. “We meet enormous challenges in our daily activities. If we do not meet regularly to talk about them, we will never be able to improve our job”, she says. Nestor Bankumukunzi, Minister of Information and Communication, says Burundian journalists work freely and their rights are respected. “They have their own rights and obligations. They do well their daily activities and are not persecuted. However, those who fail to meet their obligations by ignorance are corrected by competent authorities”, he says. In the wake of the failed coup of 13 May 2015, five media were destroyed and closed and some journalists were forced into exile. Christophe Nkezabahizi, a cameraman of the National Television was killed with his family, on 13 October 2015. 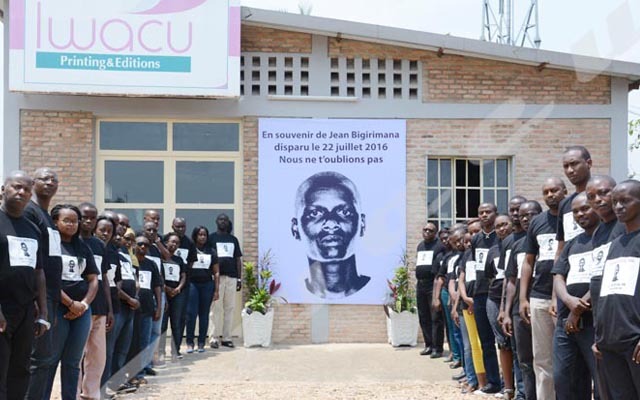 Jean Bigirimana, a journalist at Iwacu Press Group was reported missing on 22 July 2016. No light has so far been shed on their cases. Over the past 11 years, the United Nations reported that more 900 journalists have been killed for bringing news and information to the public. It revealed that only one in ten cases committed against media workers over the past decade has led to a conviction. The United Nations General Assembly proclaimed 2 November as the ‘International Day to End Impunity for Crimes against Journalists’ in its 68thGeneral Assembly. The date was chosen in commemoration of the assassination of two French journalists Ghislaine Dupont and Claude Verlon in Mali on 2 November 2013. The general assembly condemned all attacks and violence against journalists and media workers. It also urges Member States to do their utmost to prevent violence against journalists and media workers, to ensure accountability, bring to justice perpetrators of crimes against journalists and media workers, and ensure that victims have access to appropriate remedies. Reporters without Borders reported that 47 journalists have been killed in 2017 worldwide.